The government calls on producers to boost supplies of ready-to-eat foods. What does the weather mean for Russian agriculture? The EU mostly imports Russian frozen fish, seafood and wheat. Russia exported $3.2 billion of food products and agricultural raw materials to countries beyond the CIS in January-March 2013. The figure accounts for 1.9 percent of the country’s total foreign trade turnover, according to a report by the Federal Customs Service. As of today, only 12 Russian companies are authorized to export food; moreover, some of them are owned by big transnational corporations. Wimm-Bill-Dann, a juice and dairy food producer licensed to supply foods to foreign markets, was acquired by PepsiCo in 2011. Other exporters include ice-cream maker Russki Kholod, which sends small shipments to the United States, and Kaliningrad-based producers of canned meats Deima and Sovereign. Yet they only supply a few tons of their products to the European market each year. The main reason is that the Russian companies certified to export their products to foreign markets operate in niches already filled by the West. Even so, Dmitry Rylko, analyst at the Institute for Agricultural Market Studies (IKAR), believes that the Europeans deliberately certified the categories in which Russian producers cannot compete. Rylko believes that these obstacles became surmountable when Russia joined the WTO. It must have been the WTO accession that prompted the Agriculture Ministry to appeal to domestic food makers. Russia may want to increase export supplies using vodka, a trade mark Russian drink. Russia supplies up to 5 million decalitres of vodka to countries outside the CIS annually; Russki Standart, the most export-orientated Russian alcohol producer, accounts for 10 million liters of exports. Vadim Drobiz, President of Russia’s Research Center for the Alcohol Markets, says that, in order to increase vodka exports, Russia needs to elaborate a state policy for promoting vodka on foreign markets as Russia’s national drink. Japan, Scotland and France are excellent examples, with their national beverages—sake, whisky, cognac and champagne—protected at the international level. Other products with excellent export prospects are flour (processed grain), vegetable oil (oil crops) and sugar beet products. Rylko believes Russia is already capable of increasing exports of the last two categories. 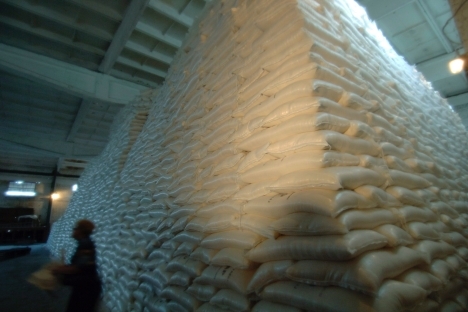 Rylko argues that Russia is capable of doubling its flour exports but it will be hard to boost deliveries further because of the nature of the market. Flour traditionally accounts for up to 10 percent of the global wheat market and exporters have had to put up with this and export unprocessed wheat to foreign buyers.